Written by Shirley Keene and Thomas Bishop (with excerpts from our web site, www.jebstuart.org. Shirley Keene is President of the JEB Stuart Preservation and Bishop is the Media Representative). 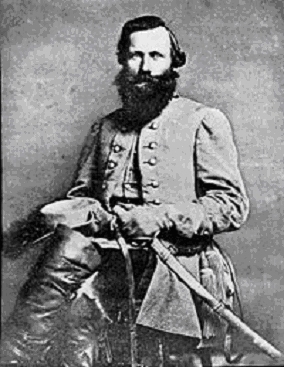 James Ewell Brown (JEB) Stuart was born at Laurel Hill in western Patrick County, Virginia to Archibald and Elizabeth Stuart on February 6, 1833. Laurel Hill, is the birthplace of Maj. General JEB Stuart, the famous Cavalry leader of The Army of Northern Virginia, in the American Civil War, working under the leadership of General Robert E. Lee. Today, Laurel Hill is a highly visited tourism site in the community of Ararat, Virginia with 1000's of visitors each year. Laurel Hill was placed on both the Virginia Landmarks Register and the National Register of Historic Places in 1998. The tranquil and beautiful place known as Laurel Hill is nestled beneath the Blue Ridge Mountains of South Western Virginia in Patrick County. Tragically, on May 12th, 1864 his dream of returning to Laurel Hill ended with his death as a result of the wound he received during the engagement at Yellow Tavern (near Richmond, VA) the previous day. Laurel Hill is located seven miles north of the city of Mt. Airy, North Carolina, less than a mile beyond the Virginia-North Carolina border. Laurel Hill is owned and maintained by the J.E.B. Stuart Birthplace Preservation Trust Inc., and welcomes visitors during daylight hours, each day of the week. Information for a self-guided walking tour is provided near the entrance to the property. The Town of Stuart, Virginia has been named after General Stuart. 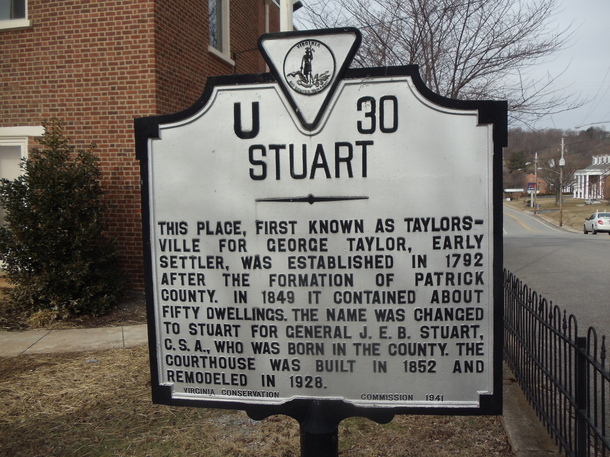 Originally the town name was Taylorsville and it was re-named in honor of General Stuart. Today a Confederate monument stands in the lawn of Patrick County Court House in Stuart, VA, with a special plaque recognizing General Stuart. Also he is honored on the Wall of Fame in the Patrick County Veterans Memorial Building on Rucker Street, Stuart, VA, with an antique portrait of him. 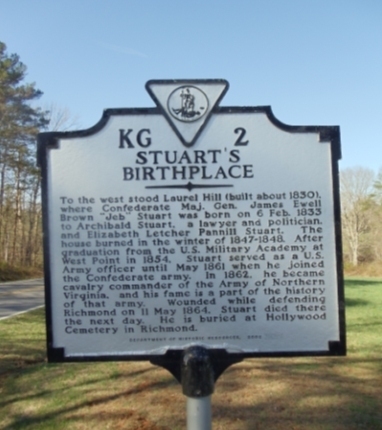 Seven of the eleven children born to Archibald and Elizabeth Stuart were born at Laurel Hill including James Ewell Brown Stuart who would, in later life, become one of the most celebrated heroes in the cause of Southern Independence. A fire in the winter of 1847-48 destroyed the family home and it was never rebuilt. With the death of Archibald Stuart in 1855, Mrs. Stuart retained the property until 1859 when she sold it to two Mt. Airy, North Carolina men. Subsequently, the once vast fifteen hundred acre parcel was sold and sub-divided down through the years. In the early 1990's a non-profit trust was founded that was able to purchase seventy-five acres that was contained in the original Stuart farm. General Stuart graduated from Emory and Henry College and the US Military Academy at West Point. The first seven years of his Army career was spent in service with the First United States Cavalry until his resignation from the United States Army to offer his services to Virginia. During this time he had risen to the rank of captain, and had married Flora Cooke, the daughter of Union General Phillip St. George Cooke. In 1859, while in Washington negotiating the sale of a saber device he had invented to the War Department, he was directed to accompany then Colonel Robert E. Lee to proceed to the armory at Harpers Ferry and suppress an insurrection led by the abolitionist John Brown. 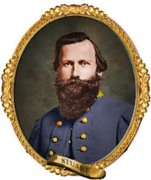 During the soon to commence Civil War, Stuart would achieve fame as the commander of General Robert E. Lee's cavalry, but Laurel Hill remained in his thoughts throughout the protracted struggle. In a letter he expressed these thoughts by saying how he longed after the ending of the war to "ramble over the dear old hills of Patrick, amid all the pleasures of a mountain home." General Stuart had a talent for music and sang songs and was always humming and whistling. He had a personal banjo player, Sam Sweeny who played the 5 string instrument at night around the camp fire. Two of his favorite songs were, "Jine The Cavalry" and "Sweet Evelina". He is considered by many as military tactual genius, who led from the front rather than directing from the rear. General Lee said, "He is and ideal soldier". He was a very religious man who sent money back to home in Ararat for the local church. He attended church services and communion when possible during the Civil War. He made a vow to his mother to never drink alcohol, and kept that vow his entire life. He had a very happy demeanor causing everyone to laugh. He could even make General Stonewall Jackson laugh. Henry Kyd Douglass said, "He is the genuine soul, full of life and humor. He is never quiet, whistling on the battlefield, singing in the camp, laughing and dancing in the parlor." In writing about Laurel Hill, he told his wife Flora, that he wanted to go with her to the Dan River (in Patrick County) and gather violets on the hills. In a letter to his brother, William Alexander in 1863, "I would give anything to make a pilgrimage to the old place, and when the war is over quietly spend the rest of my days there." Final Comments It is our distinct pleasure to write about General Stuart and tell the life story of him and other Stuart family members. Recently, we have had the joy of providing personal tours of Laurel Hill and the Town of Stuart to two great-great grand daughters of JEB Stuart. We hold a monthly radio show on WHEO 1270 AM to provide information to the general public and promote our special events. We encourage people to contact us directly for special guided tours or more information using our contact information below. We print a bi-annual Newsletter and would be glad to mail a copy upon request. Feb. 4, 2017, at Mill Creek Store in Mt. Airy, NC, 10am-2pm, Free birthday cake and lemonade, music by the Lone Ivy String Band. Event is free and parking is free. October 7-8, 2017, 9am-4:30pm, at Laurel Hill, Ararat, VA 300-400 reenactment soldiers will be in uniform reliving historic battle scenes Activities include, merchandise tent, various concessions, authentic Civil War Sutlers, Sunday Worship services with Civil War Chaplain, Square Dance, Ladies 1800's Fashion Show, Music Entertainment, Food Vendors, Night Time Candle Light Tour. Admission is $8 per person, children 12-under free Parking is free. All proceeds go toward preserving the Birthplace. "A Family Friendly Event"